Do you find it easier to be with God when you're in the natural world? Do you care about the environment locally and globally? Would you like to be part of an exciting fresh expression of church? Do you like to walk in the woods? Then Oakwood Forest Church is for you. 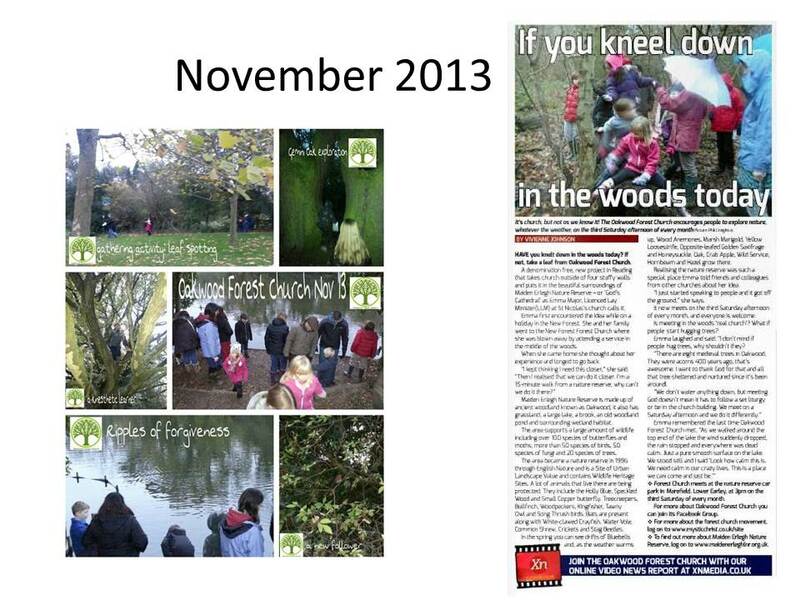 We meet four times a year at the Interpretation Centre at Maiden Erlegh Nature Reserve in Earley for an hour in God's natural cathedral "worshipping in nature " WIN. You can park at the car park at the end of Marefield, Lower Earley, Reading. RG6 3DU. Or on the side of Instow Road, alongside the Interpretation Centre RG6 5QJ Oakwood Forest Church is led by Christians from Churches all across the Reading area; if you'd like to be part of the team then please send us a message. This entry was posted in Uncategorized on June 15, 2018 by oakwoodforestchurch. What a wonderful afternoon celebrating Pentecost by finding renewed life in nature and talking about the holy spirit at work in our lives. Here are a few photos of rocks, which were then decorated and hidden; an amazing staff as a monument to nature; the intense greens of the reserve admired by Sarah; and Mike with the flower decorations made by Liz in the background. Our Bible readings, reflections and prayers from today are included below. Suddenly a sound like the blowing of a violent wind came from heaven and filled the whole house where they were sitting. They saw what seemed to be tongues of fire that separated and came to rest on each of them. All of them were filled with the Holy Spirit and began to speak in other tongues as the Spirit enabled them. I wonder…. Did the holy spirit just come upon the people? Or do this outpouring of God also invigorate the animals and plants of creation? Then later in his letter to the Romans Paul speaks of the God of creation; about the hope in the world given by the holy spirit. I wonder… The holy spirit came to empower the disciples and to empower us all. But what are we empowered to do? How does this relate to caring for creation? ever obstructs the message of the God within each of us. the Word of God in our heart, to speak it with courage, to follow it faithfully and to fan it to flame in others. for everyone’s power and presence. This entry was posted in Uncategorized on May 20, 2018 by oakwoodforestchurch. 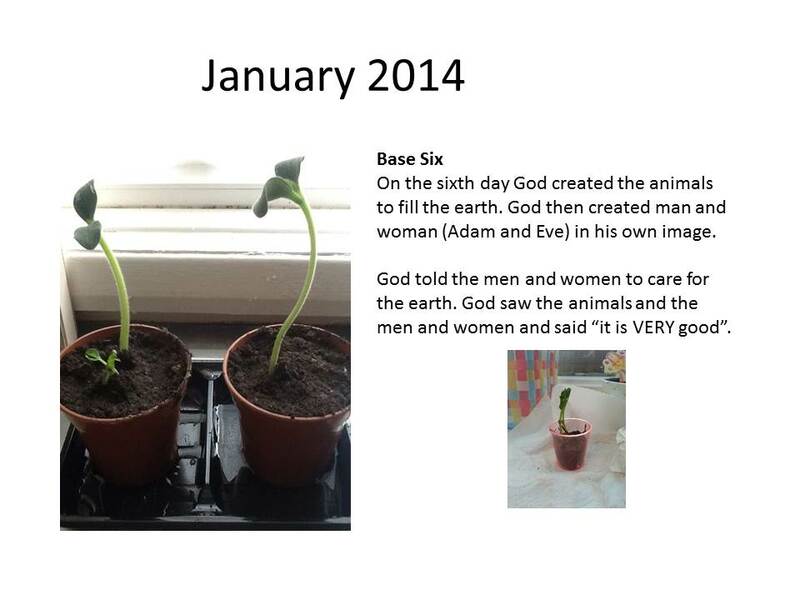 Today, as we sprout anew after two years of being dormant, we are going to remind ourselves about God in creation. We’re going to look for God in His natural cathedral. And theologians across the ages have reinforced the importance of finding God in nature. For example…. For the next 45 minutes you’re invited to explore where you wish in the nature reserve. Maybe around the lake, or in the woodlands, or in the hedgerows. Go out and look for Jesus in the trees and flowers and animals of Oakwood. And when you find the creator I invite you to follow Jesus’ continuing invitation to “Knock and the door will open”. Pray your thanks or requests, your praise or your pain. Knock in prayer and know that our creator God will be listening to you. If you wish to write the prayers and leave them where you find God then there are some wooden sticks here for you to use. Or leave one of these stones there to bless someone else when they’re found. 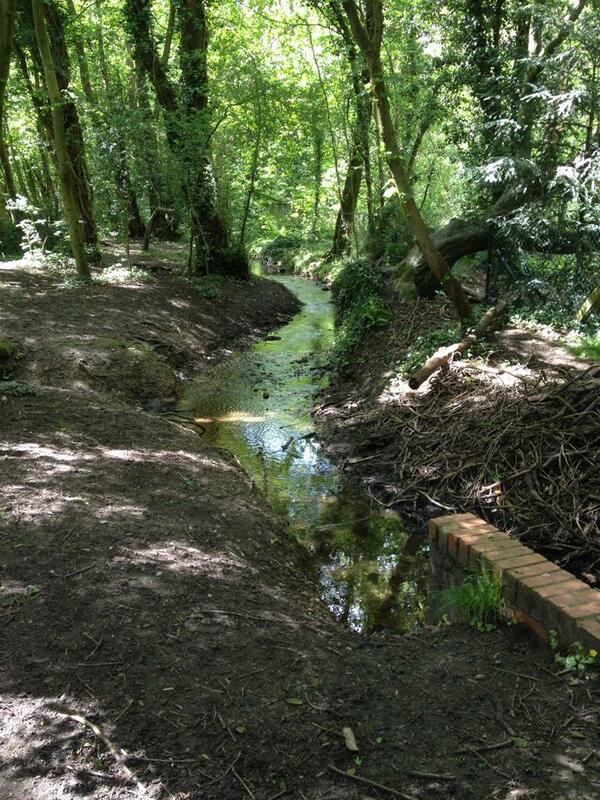 Well actually it remains peaceful in Oakwood and all around Maiden Erlegh Nature Reserve, a peace you only find in the midst of nature. We hope it’s been peaceful where you are whilst we’ve not been meeting, and hope you might like to join us as plans are afoot to meet again. Sickness and disability struck the Oakwood forest church team and we’ve not been able to organise gatherings for a few years, but as the snow drops emerge so we’re emerging with ideas for how we can meet again in an accessible way. This entry was posted in Uncategorized on January 16, 2018 by oakwoodforestchurch. 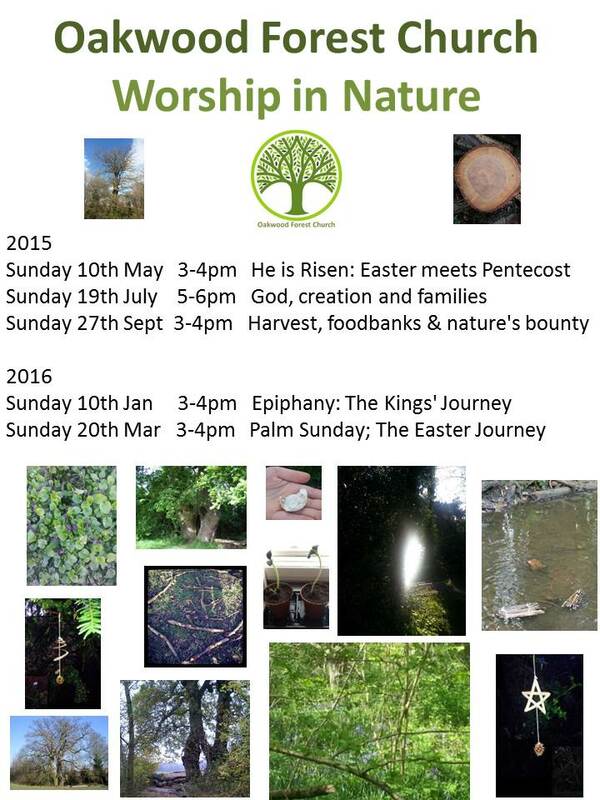 Starting On Sunday May 10th 2015 Oakwood Forest Church will be meeting four times a year on a Sunday afternoon/evening at The Interpretation Centre at Maiden Erlegh Nature Reserve. The cost of hiring the interpretation centre is £14.55 for 90 minutes. We will be asking for donations at each meeting of Oakwood Forest Church to cover the cost of the hire, tea and coffee and the materials used for activities. This entry was posted in Uncategorized on April 29, 2015 by oakwoodforestchurch. 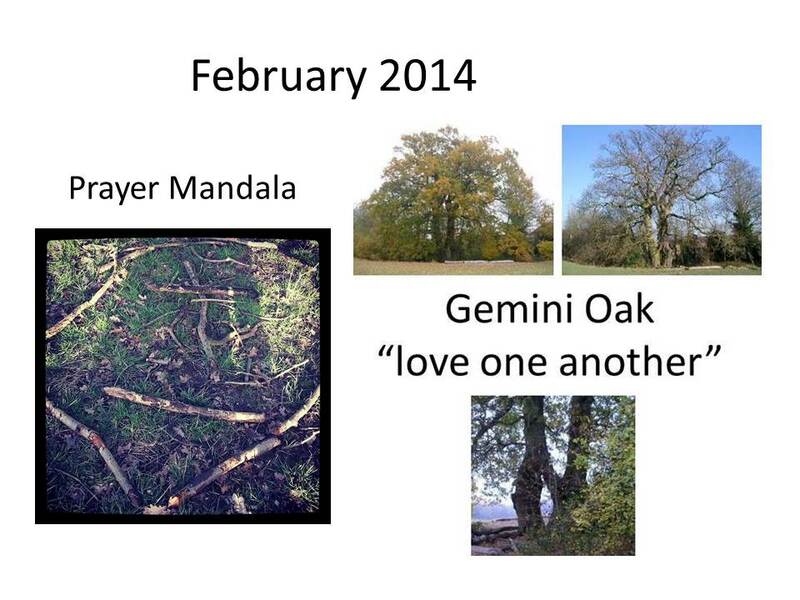 These slides were presented at the Earthing Faith Gathering in May 2014. The outline notes are included below but Emma has never been known for sticking to any notes and this time was no different. 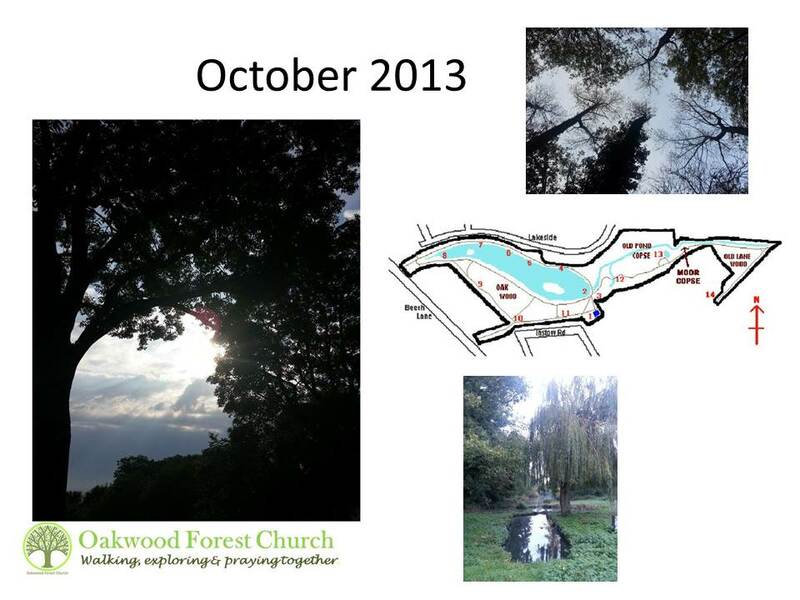 Oakwood Forest Church met for the first time in November 2013. Sprouting from a visit to the New Forest Forest Church and conversations with friends from other churches in Earley. We are the sort of people who go for walks in the woods when we are trying to find some quiet time with God and so the idea of combining Church with nature was very appealing, especially in our very urban location. The great thing about starting a forest Church is that there are no costs and no buildings to worry about. One quick conversation with the ranger of our nature reserve and another with our church insurers was all we needed to meet for the first time with everyones blessing. 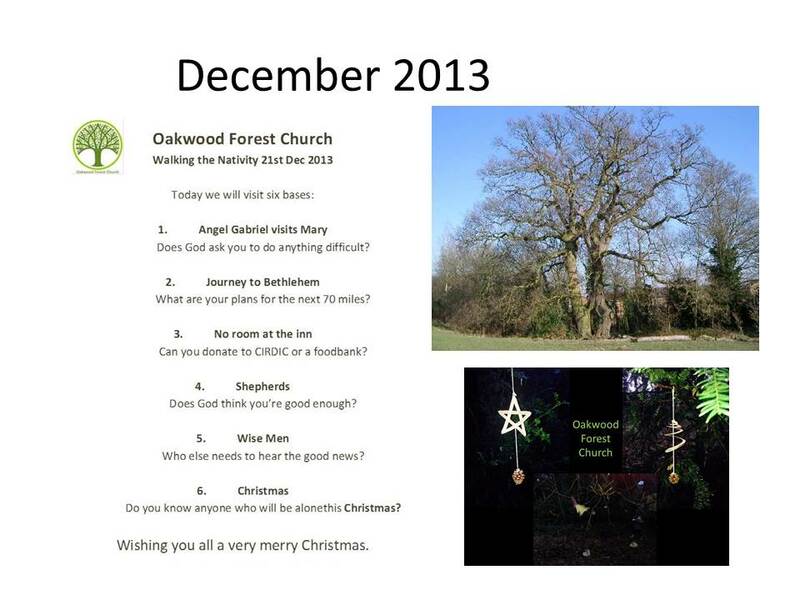 So what is Oakwood Forest Church? 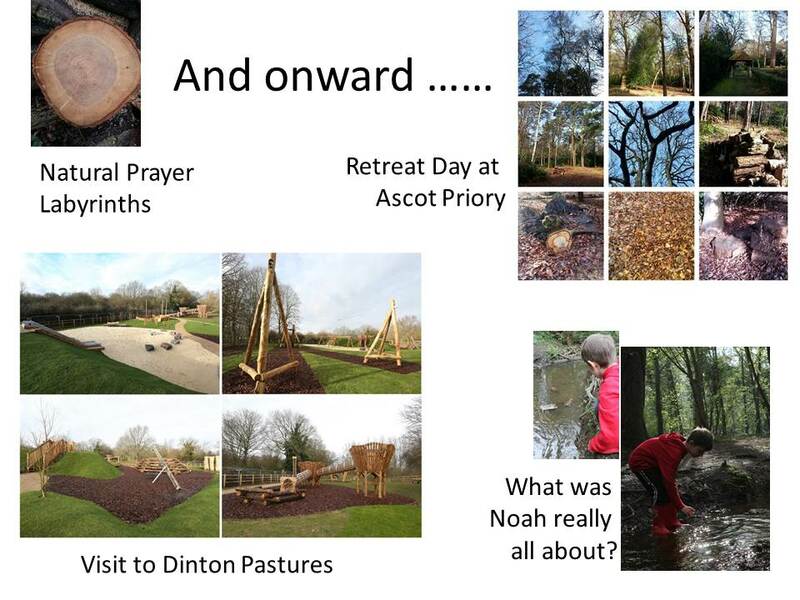 It’s hard to explain how Forest Church looks if you’ve never been to one of the meetings but it is best summarised as walking, exploring and praying together in God’s natural cathedral. We are a group of people, gathering to meet God and journey together. Over the last six months we’ve had over 50 people come to one or more of the five meetings. 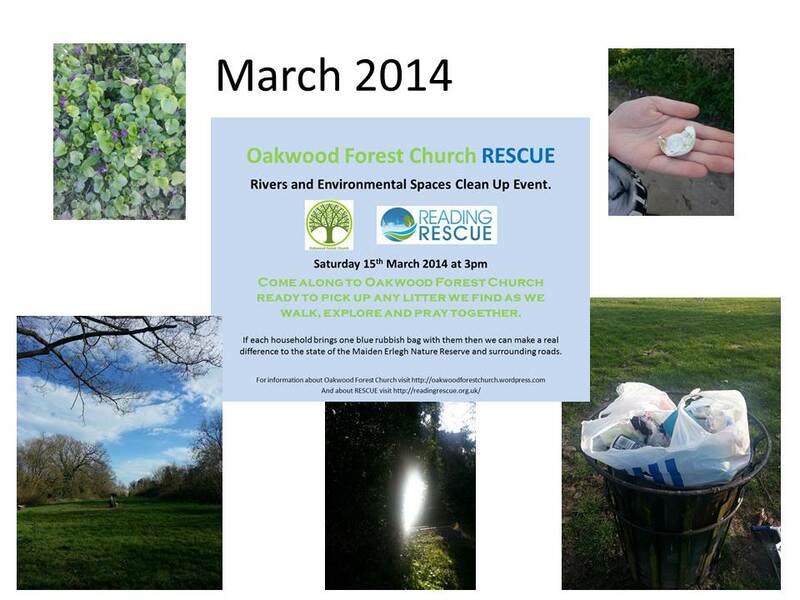 We’ve also joined with a local church to run an Easter woodland walk which had over 150 people take part. We have over a dozen members who don’t go to any other Church and who find God in the natural connections of the world; for them this is an opportunity to explore faith and what Jesus is all about. Starting a forest Church may not be for everyone; but holding forest Church type events could be a really great way of linking your congregation to the natural world and the environment we are called to protect. It is also a wonderful way of meeting with people who are seeking faith and who are looking for a way of engaging with faith outside of church buildings. 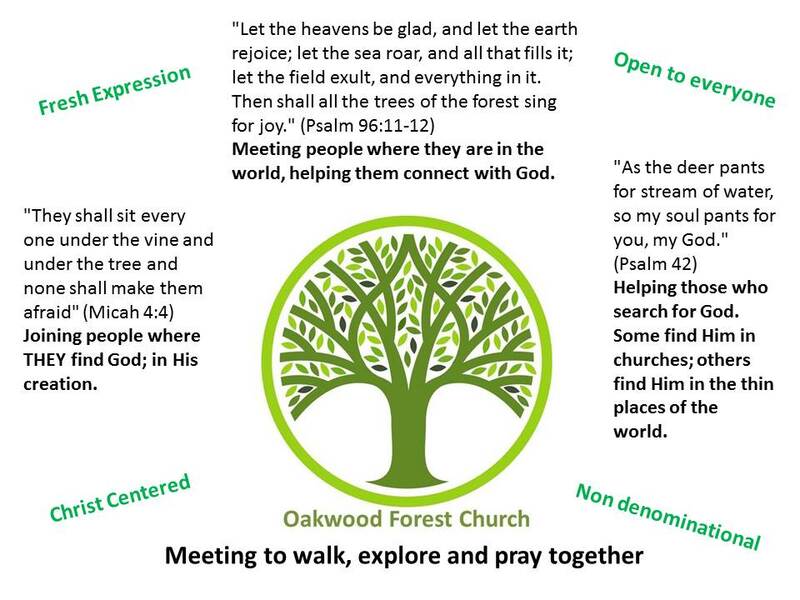 The format of each Oakwood FC meeting will vary slightly; but we will start by meeting and praying together before walking and exploring for an hour in God’s presence. 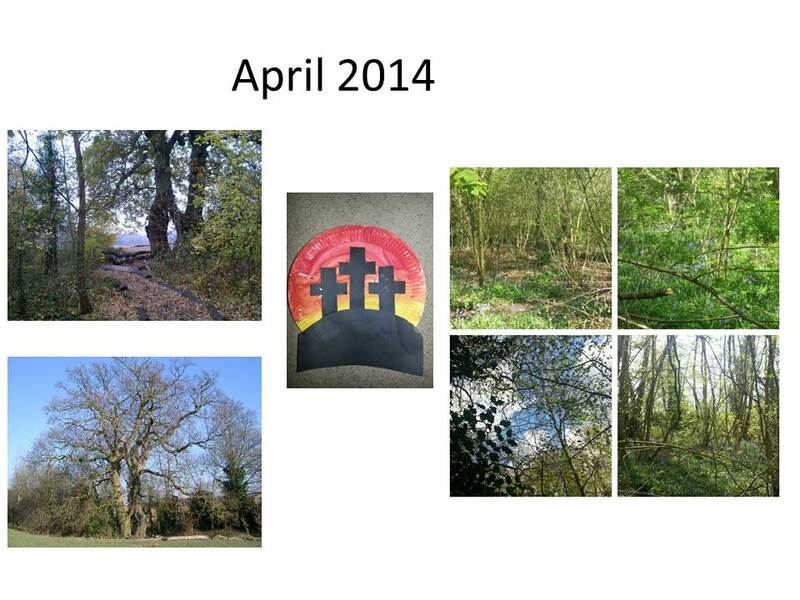 This entry was posted in Uncategorized and tagged church, church of england, diocese of oxford, oakwood, oakwood forest church, photos, presentation on May 15, 2014 by oakwoodforestchurch. Made to be in relationship with God. Made with five distinct ways of sensing the Spirit of God. Our eyes see everything and yet often they see nothing. Slow down and stop; allow your eyes to really see. How many individual pieces of natures jigsaw can you count? Which stands out for you? Which takes your breath away? Is that God showing Himself to you? Before we recognise anything else we hear the voice of our mothers. If you stop quietly now what can you hear? Beyond the sounds what else can you hear? Can you move them aside? In the distant bird song? In the rustle of the trees? In the movement of the lake? Turn to face the wind. Can you feel it on your face? On your hands? Is it warm or cold; fierce or gentle? Now take your hands and pick up a leaf, stone or branch. Close your eyes and let your fingers feel nature. Is it smooth or rough? Old or new? Alive or dead? Turn to someone else and hold hands. How does this feel? Awkward or easy? What do these hands tell you about the person? What does this tell you about God? And what do your hands tell someone else? Does anything taste as good as cold water on a hot day? Perhaps hot tea on a cold winters day? How about blackberries fresh from the bush? Or carrots straight from the ground? When did you last taste something that took your breath away? We have lost connection between our food and our plate. Where did your lunch come from? How good did it taste? Did it damage the world we live in? Did it taste good enough for the damage it did? Finally turn your attention to your nose. Your nose can smell more than 1 trillion different smells! How many can you smell right now? As you walk in a spiral away from the base try and identify the odours on the air. How many are man made? How many come from the natural world? Which do you like? Which do you not? The sense of smell is most closely linked to memory. Is there a smell which reminds you of someone in your past? Or a meal? Or some other event? Is there a smell which reminds you of God? Perhaps a smell from a church? or from a family meal? How does it feel to sense God with you again through that memory? God is not a being in the distance. He is not the creator who abandoned us long ago. God is alive and with us in The Holy Spirit. Smell Him if we only stop and look and wait and let ourselves find Him. Today, tomorrow, any day, every day. This entry was posted in Uncategorized and tagged church, forest church, God, holy spirit, oakwood, senses on May 15, 2014 by oakwoodforestchurch.